Prehistoric life was an eat-or-be-eaten world. 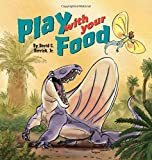 When a small gliding lizard finds itself on a Dimetrodon's menu, it must convince the larger predator to play with its food. Through vivid, colorful, and humorous artwork, this tale the survival of the fittest into the survival of the funnest.